When I looked up and saw the giant cloud of snow billowing across the icefall and realised there were dozens of people trapped up there, I never thought I would ever see it as a straightforward climbing accident. It was 6.45am on 18 April 2014, and I was walking through Everest Base Camp. I was about to climb into the Khumbu Icefall for the very first time, and if I had set off three hours earlier I would have been caught in the avalanche myself. The Khumbu Icefall is a steep cascade of towering ice blocks and deep crevasses that acts as both an obstacle and entrance hall to Everest’s upper reaches on the Nepalese side of the mountain. The ice is slowly moving, and it’s necessary to climb when the weather is cold to reduce the risk of ice towers collapsing while you are underneath them, or snow bridges breaking as you cross them. When George Mallory first looked down into the Khumbu Icefall from Tibet in 1921, he dismissed it as unclimbable, but in 1951 a team led by Eric Shipton made it most of the way up until they reached a crevasse too wide to cross. The following year a Swiss team defeated this obstacle by climbing down into the crevasse and throwing a rope across, and since then expeditions have used everything from ropes, ladders and even logs to overcome the difficulties. The British team who made Everest’s first ascent in 1953 gave features in the icefall evocative names that leave little to the imagination: Hillary’s Horror, Hell Fire Alley, Atom Bomb Area, Ghastly Crevasse, and The Nutcracker. In 1963 an American climber, Jake Breitenbach, became the first of many to be killed by a collapsing ice tower. The Khumbu Icefall had a formidable reputation for sure, but I was more excited than afraid. 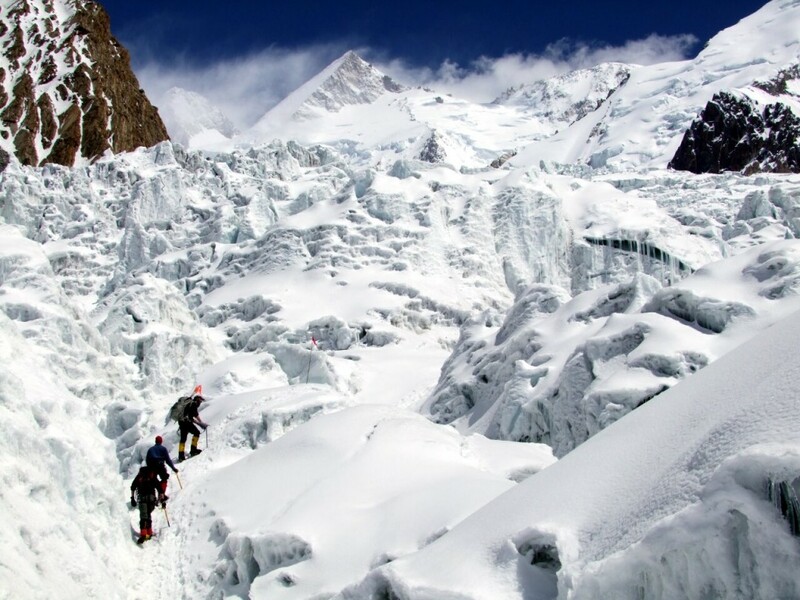 The first icefall I ever climbed through was the South Gasherbrum Icefall in Pakistan, which forms the route from Base Camp to Camp 1 on two 8000m peaks, Gasherbrum I and Gasherbrum II. I ended up climbing through it twelve times, and by the end of our expedition I could remember every feature, despite ice movement and snow melt changing the route every time I passed through. Climbing through a maze of natural ice sculptures with breathtaking mountains up ahead was an unbelievable experience, and surely beats the world’s most exciting art exhibition. I returned with some amazing photos, and from what I knew about the Khumbu Icefall, I expected it to be even more intricate. The history and beauty of the icefall drew me in, and I knew it was something I had to experience. But as we walked through Base Camp that morning there was a loud crack, and a huge chunk of ice detached from the West Shoulder. It landed on the edge of the icefall and triggered a vast avalanche, the biggest I had ever seen, which billowed across in a giant cloud of snow until it touched the foot of Nuptse on the other side. The ice landed near a group of Sherpas who were queuing to climb down a fallen ladder, and dozens were struck by exploding fragments. 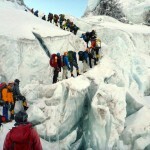 Everest has seen its share of multiple tragedies. As early as 7 June 1922 seven of George Mallory’s Sherpas lost their lives in an avalanche on the North Col Wall. Six Sherpas died in an avalanche in the Khumbu Icefall on 5 April 1970, and on 9 September 1974 a French climber and five Sherpas died in an avalanche on the West Ridge. More famously eight climbers died in a storm on 11 May 1996, an event described by Jon Krakauer in his book Into Thin Air. Six people died in separate incidents on the very day I reached the summit myself, 19 May 2012. The avalanche I witnessed on 18 April last year trumped them all by some margin. Sixteen Sherpas lost their lives, and I found myself caught up in events beyond my ability to comprehend. Later that morning I watched body after body retrieved from the icefall by a helicopter which dangled them beneath it on a long line. In the evening a mob of Sherpas from another team marched past our dining tent, chanting words we didn’t understand. 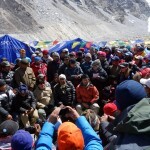 It was the first of a series of protests at Base Camp which led to the mountain being closed for climbing a week later. I watched two of the protests. They were conducted almost entirely in Nepali, and I found myself a helpless bystander on each occasion. Climbing accidents are not unusual in the mountains, and while this was no ordinary climbing accident the events I witnessed were unprecedented. 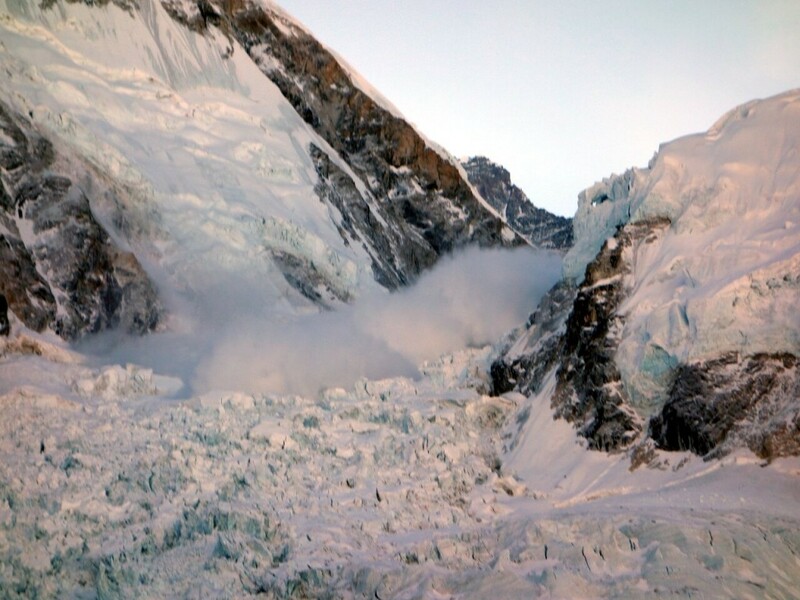 A similar avalanche triggered by a collapsing serac occurred on nearby Manaslu on 23 September 2012. On that occasion 11 people died, but only one was a Sherpa. Many people left the mountain afterwards, but only those who chose to. Plenty stayed and reached the summit a few days later. 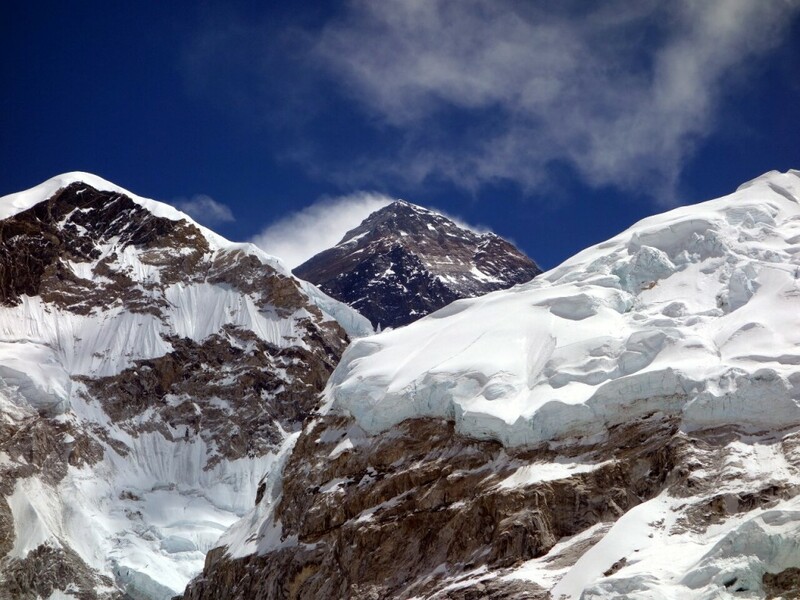 When I climbed Cho Oyu in September 2010, two separate avalanches caught teams of Sherpas and mountain workers employed by the China Tibet Mountaineering Association. There were no fatalities, but many injuries. Four hundred of us packed up and left the mountain en masse after deciding conditions were too dangerous. I had seen strikes by mountain workers too. In Pakistan in 2009 our progress up the Baltoro Glacier was halted when our porters woke up to snow one morning and decided to stay put that day. The following day the weather was fine and they continued. In Nepal the following year some of our porters refused to move one morning during the trek to Baruntse, but our sirdar Dawa quickly resolved it by having their loads reweighed, and we set off a couple of hours later. But this was different. Protests were more organised; there were leaders, speeches and demands issued. 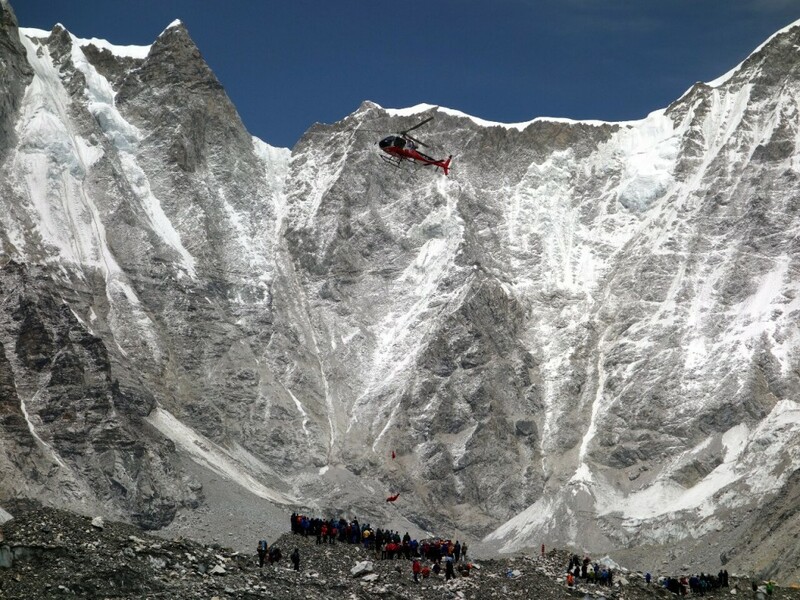 There was an undercurrent of violence, and a number of Sherpas and climbers were physically threatened. I returned to Kathmandu confused and bewildered. The avalanche had been shocking, but it was easy to make sense of. The events which followed left my brain frazzled, and it was obvious there was something going on I didn’t understand. Media coverage of the avalanche was beyond dreadful, ranging from plain ignorant to wilfully insulting. The gist of it was that rich westerners like me had sent poor unwilling Sherpas to their deaths as we ticked off another item on our bucket lists. Few journalists took the time to understand Sherpa history and how it was interwoven with Himalayan mountaineering, or Nepali politics, the backgrounds or motivation of western climbers, or the labour market that sent many Nepalis abroad looking for work. These were factors at play that would have provided them with a better understanding. I was frequently contacted by journalists while I was back in Kathmandu, but I didn’t talk to any of them. I was still trying to make sense of things myself, and I didn’t trust them to listen to my point of view. Those I knew who spoke to journalists had their words taken out of context and tailored to suit a preconceived story. Providing a quote for someone who would probably write something negative about me, was as appealing as a yak turd sandwich drizzled in bat’s piss. It was impossible not to feel bitter about what I read. I needed time to figure things out, and then I considered it my duty to present the other side of the story on behalf of commercial climbers and operators. It took me months to realise it wasn’t a dispute between mountain workers and western climbers, but a political dispute by disillusioned Nepalis, who had used the avalanche as a forum to air grievances with their government. The avalanche claimed its victims, but we were also victims to a lesser degree. I learned one other thing: that I didn’t want to be used as a pawn for a second time. A yak tug-of-war team wouldn’t be able to drag me back to Everest the following year. It seemed more than likely something unpleasant would happen again. I was right, but not in a way I could possibly have imagined. What happened this year was immeasurably worse and had nothing to do with politics or mountaineering. I kept away from Everest this year, but I knew many people who for different reasons chose to return. One was my partner Edita. She also witnessed the avalanche on Everest last year, and was in her tent at Camp 2 on Manaslu when the avalanche struck in 2012. April 25 this year was to be the third of her nine lives. When I woke up at home that morning the first thing I did was check my email. She had sent me a blog post to publish about her first climb into the icefall two days earlier. I never got round to posting it for her. A few minutes later a news item caught my eye saying there had been a 7.8-magnitude earthquake close to Kathmandu. My immediate thought was not that buildings were demolished, and that thousands must be dead in Nepal’s capital, but that an earthquake that powerful would surely have triggered another serac collapse on the West Shoulder, and there was a high chance there were more casualties in the Khumbu Icefall. I knew Edita was not among them because she was back at Everest Base Camp, but I sent her a text message to see if everyone was OK before glancing through my Twitter timeline. There was lots of rumour and speculation, but some of what I read filled me with horror. For the next four hours I didn’t know whether Edita, or many of my other friends at Base Camp, were dead or alive. She usually responds to my messages almost immediately, but this time I heard nothing. I scoured every source I could looking for more information, and wandered around the park opposite where I live in a daze. Eventually I learned from a mutual friend Mila on Facebook, that all of the Altitude Junkies team I climbed with last year were alive, if not entirely safe. One of the team, Margaret, had managed to call her husband by satellite phone. The earthquake had triggered another huge ice collapse on the ridge between Pumori and Lingtren, two mountains on the opposite side of camp from the Khumbu Icefall. This time climbers in the icefall turned out to be in the safest possible place, although they found themselves stranded as the route fell away beneath them. The collapse sent an avalanche powering through the middle of Base Camp, bringing boulders like missiles. Nineteen people were killed, but the tents on either edge of camp were spared. Edita’s team escaped tragedy by the length of an ice axe. Their storage tents were taken away, but dining and sleeping tents were just outside the danger zone. Traumatised, terrified, but glad to be alive, they spent much of that afternoon helping to dig out bodies and transport casualties. Meanwhile I was safe at my flat in London, but the weekend proved to be a surreal one as I spent much of it glued to my computer screen. In the afternoon Facebook’s new disaster safety system kicked in. I was notified that I had 17 friends in Nepal, and was invited to mark them as safe. I knew of at least a dozen other friends who were also in Nepal but hadn’t marked their location on Facebook. By then I had news of about half of them, so I performed my good deed by marking them all as safe. What I didn’t know was that I would receive a notification every time one of their relieved friends posted them a message of support. My phone pinged incessantly for the next hour, and eventually I turned it off. Facebook’s new Safety Check feature is a great idea, but it has teething issues. 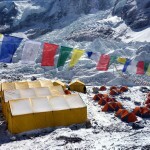 Many of the people I marked as safe were stranded at Camps 1 and 2 above the Khumbu Icefall. They were alive, but far from safe. But I couldn’t possibly ‘unsafe’ them for fear of terrifying their friends and family. But my troubles were small compared with what I experienced the previous year, and even that paled into insignificance with events in Nepal this year. What happened last year troubled me greatly for several months afterwards, but essentially we had simply watched a climbing accident followed by a labour dispute. We waited in expectation for a week then went home dejected. For sixteen families life would never be the same again, but for everyone else it continued very much as it ever had. This year those at base camp waited in fear. The initial earthquake was followed by many smaller ones daily. Base Camp was usually a place of safety and security, but this time nobody knew whether it was safe or not. There were still many ice seracs on the surrounding mountains that could break off, and they cowered in terror every time there was another tremor. There was no question of continuing their expeditions, but what should they do next? Outside Base Camp more than 8,000 people were dead and thousands more were homeless. For two or three days parts of Kathmandu were without power or water, and people slept outside for fear of another major quake. It was some time before news filtered in from remoter parts of Nepal. Over a hundred trekkers were missing in the Langtang region, and Langtang village was completely destroyed. 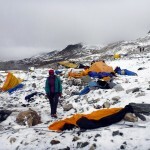 Many teams at Base Camp didn’t know about the situation beyond. They feared that hotels would be closed in Kathmandu and tea houses destroyed on the Everest Base Camp trail. Some chose to brave the unknown dangers of Base Camp and wait for news rather than trek back to Lukla for a flight back to Kathmandu. Edita’s team was one of these, and when they left it was with a great deal of relief. The media turned their attention to Nepal again, but this time the situation was very different. There was sensationalist reporting again for sure, but there wasn’t the tabloid-style blame we saw last year. 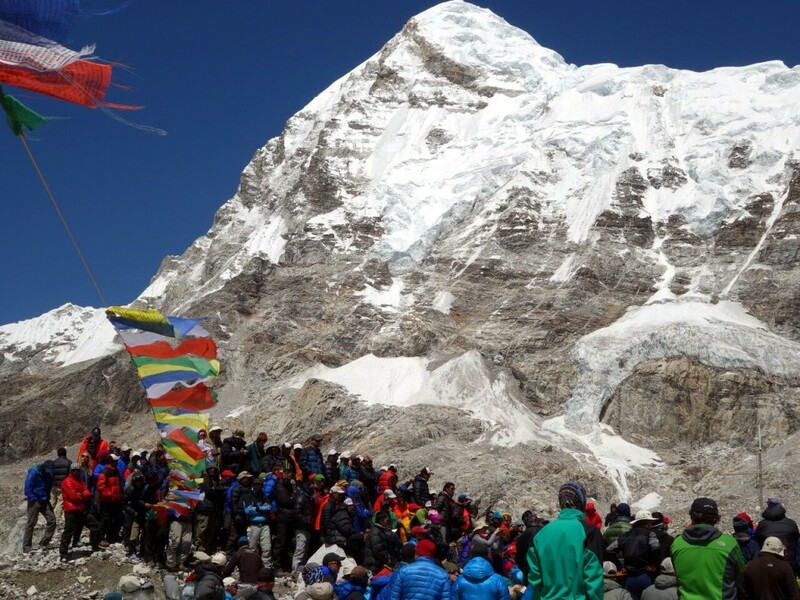 This year many more film crews and journalists travelled to Base Camp hoping for a story, but Everest reporting has improved a lot in the last year. Journalists have done more homework, and there are even those who try to understand the commercial climber’s perspective, a marked contrast from the past. They got their story, but it was a very different one from what anyone expected. This time it was a clear tale of natural disaster without blame, and while there were stories of human error and conflict too, they were far outweighed by the positive human stories. Aid poured into Nepal, tourists stayed to help where they could, and ordinary Nepalis worked together to help each other. I’m sure others will see it differently, but these are the things that stood out for me. I watched the events from a distance this time, and counted myself blessed I wasn’t tempted to return to Everest this year. I can only imagine what it was like for those who lived through it, and I have many friends in Nepal who are living through it still. If Everest’s future was uncertain after last year’s events it is even more so now. We don’t know how long the aftershocks will continue for, but it’s conceivable they will still being going on this time next year, and no mountaineer in the world can assess the safety of a Khumbu Icefall pounded by earth tremors. This time the uncertainty extends beyond Everest. Many people both inside and outside Nepal are keen to promote the country as safe for tourism again, and I would love to be able to say the same, but while the aftershocks continue this seems a dubious claim for mountaineering activities. It is better to set the right expectations. Himalayan peaks are unstable at the best of times, even when the earth isn’t shaking. Trekking is less risky, and you would be doing a good thing by supporting the people of Nepal, but if you decide to go you will need to accept the infrastructure is likely to be more fragile. As for me I would like to return next spring, but for the moment I will wait and see. When I return it won’t be to Everest, but to a remote trekking peak somewhere little explored. These are the holidays in the Himalayas I enjoy the most. I also believe Nepal’s biggest problem is not from the power of the earth, but from government corruption. There was a time not long ago when this situation looked hopeless, but the response to the earthquake by ordinary Nepalis has been inspirational. It is a story of people who don’t expect their government to help, so they have gone out and helped themselves. This response represents a glimmer of hope and an opportunity for a future led by more honest and capable people. If Everest last year was not the opportunity, when those who have proved themselves to be supporters were caught in the crossfire, perhaps now will be the time. In many ways Nepal’s government reminds me of FIFA. With millions in aid money pouring into Nepal, it’s very likely some of it is being stolen by corrupt members of government, but you can’t keep on doing that without expecting consequences. Most Nepalis believe in karma. Football was another story of ordinary folk getting on with playing the game while those at the top milked it for their own private profit. But see how much things can change in little more than a week. I hope if change happens in Nepal, this time it will be peaceful, for the Nepalese do not deserve another national tragedy.